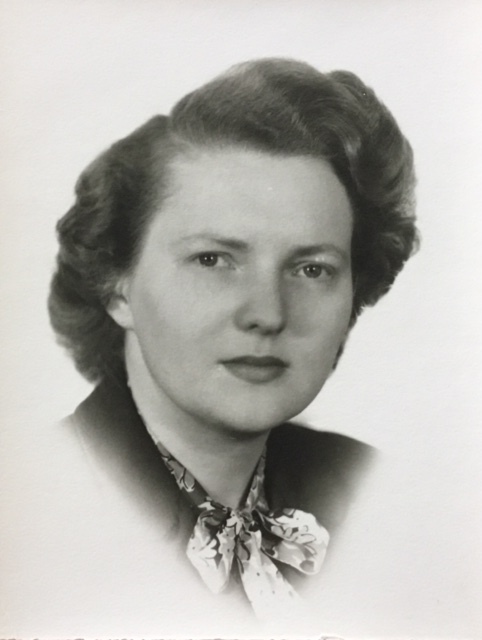 Obituary for Shirley M. Countryman | Kaniewski Funeral Homes, Inc.
Shirley M. (Swanson) Countryman, 98, died peacefully on February 6, 2019 at Hamilton Communities, New Carlisle. She was sustained by a life-long devotion to her faith and confident of being reunited with cherished family and friends in the hereafter. Shirley was born July 6, 1920 to Charles and Inez (Hagberg) Swanson in Superior, Wisconsin. She remained there until graduation from Superior State Teachers College (now UW-Superior). After teaching high school for two years in Wisconsin and Minnesota, Shirley enlisted in the US Navy WAVES during WWII. She served as an Aerographers Mate on active duty at Cape May, New Jersey and Washington D.C. Upon her honorable discharge from the Navy, Shirley returned to teaching until her marriage to James J. Countryman on June 22, 1954. They started their family in Superior, then moved to New Carlisle, IN during 1962. She was a homemaker for many years and later worked as a seamstress at Haven Hubbard Nursing Home. Shirley enjoyed being immersed in nature and was passionate about sharing her love of outdoor activities. She was a Campfire Girl as a child and later returned as a counselor. After the death of her brother, Shirley helped her father construct a log cabin and outbuildings on 80 acres he bought near Solon Springs, WI. All materials came from their land and she had many stories about preparing logs and gathering rocks for the fireplace. She spent several idyllic summers at the farm of her beloved aunt in Moose Lake, MN, reveling in hard work, fishing, and swimming with her cousins. Shirley was a member of the New Carlisle United Methodist Church and served her faith by teaching Sunday School and participating on many committees, including a long tenure as church treasurer. She also taught and participated in adult bible study. Shirley gave selflessly of her time and talents to all church activities, making intricate crafts and fabulous baked goods, sewing decorative banners, and most of all by singing in the choir, which was a particular joy to her. Love of family, learning, and teaching completed the central tenets of Shirley’s life. She was an avid reader and could knowledgeably discuss a wide variety of subjects. Those in her company could expect a gentle correction of imprecise grammar and she was a fearsome opponent in games of trivia. Shirley was never happier than when sharing the fellowship of family and friends. Shirley was preceded in death by her parents, brother, Donald Swanson, and son, Wayne Countryman. She is survived by her daughter, Mary (David) Glass, son, Chris (Mary) Countryman, grandchildren Megan Countryman, Keith (Danielle) Countryman, Matt Countryman, Brian (Carlyn Dust) Countryman, David (Brittany) Glass, Kristen Glass, and great-grandchildren Grace, Mason, and Emily Countryman. Visitation will be from 11:30 a.m. - 1:00 p.m. EST Saturday, March 2, 2019, at New Carlisle United Methodist Church, 300 E Compton Street, New Carlisle, IN. A celebration of Shirley’s life and military honors service will follow at 1:00 p.m. EST, Pastor Kalvin J. Morrison officiating. Burial will be at Greenwood Cemetery of Superior, Wisconsin on a later date. Memorial contributions may be made to the New Carlisle United Methodist Church or donor’s choice.